Cheese Pupusa & Frijoles Pupusa w/ curtido slaw, Ceviche Tostada, Salvadoran Horchata to drink. OK, SO in El Salvador they're called Pupusas—which is how the Spanish conquistadors rendered the native word 'popotlax'—but they're delicious, grilled corncakes stuffed fetchingly with refried beans, meltingly smooth white cheese ('queso'), chopped pork ('chicharrón') or zucchini ('calabasa'). Pupusas are a fairly recent foodie phenomenon in Savannah, and about the only time you could get them fresh and hot was in December at the ‘Our Lady of Guadalupe’ festival in Port Wentworth...that is, until this rovin’ foodie reporter caught a glimpse of a little ‘Coming Soon!’ sign on the front of the Krishna Food Mart on Ogeechee Rd. last month. I have noticed an appealing trend in the last couple of years of convenience stores giving space inside to tiny eateries, usually serving up local or ethnic cuisines—the only way you’d even hear about them are from those who’ve been lucky enough to drop in and find them—so I could just hug the kindly Indian owners of Krishna Food Mart for making room, however small, for Las Veronicas! Veronica Valasco of Ilobasco Cabaña, El Salvador, has been cookin’ up the good stuff since she was a kid, and has always gotten a chorus of ‘Qué rico!’ (‘Yummy!’) from family and friends. Lucky for us, when she started thinking about how to expand the family fortunes, her mind naturally went to her gift for cooking her native cuisine. Las Dos Veronicas Valasco, Hija y Mama! Pupusas are made from nixtamal, a natural corn dough that has gone through special preparation with alkaline solution before cooking—this peels the grains and softens them, making the valuable nutrients more readily available, and leaves a smooth texture quite unlike Southern cornmeal. 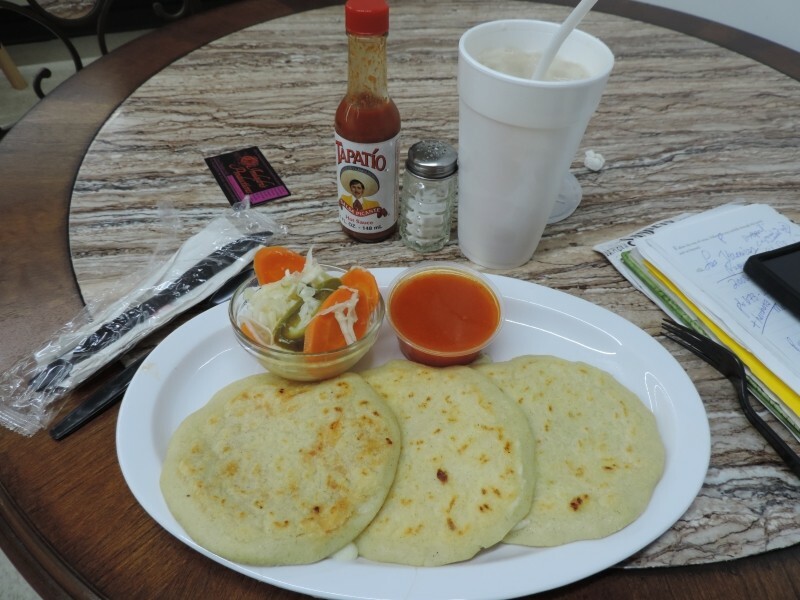 While you can get frozen pupusas at various Latin markets, there is nothing quite like a fresh, made to order corncake—that first bite with the melted queso is divine. 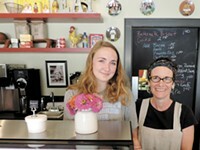 The daughter, also Veronica (thus, ‘Las Veronicas’) works the space with her mom—at least until she takes off for beauty school!—and serves customers with a shy graciousness. Just walk into the Food Mart, go a few steps toward the back and look to your left: you’ll find a little café with just two tables and a small counter—peruse the menu board, then ring the bell on the counter for service. Be sure to ask Veronica hija (daughter) what’s up for the day, because additional items are not always posted on the board and on weekends they have fragrant soups like Sopa Marisco (made with fresh, local seafood & crab) or Sopa de Res (with fall-off-the-bone tender beef + veggies). My last visit I was very happy to see Ceviche Tostadas: they’re listed as ‘tacos’, but what you get is a flat, crispy tostada topped with delicate fish, cooked in lime juice, and minced with tomatoes, onions and cilantro: a tasty and perfect light lunch! 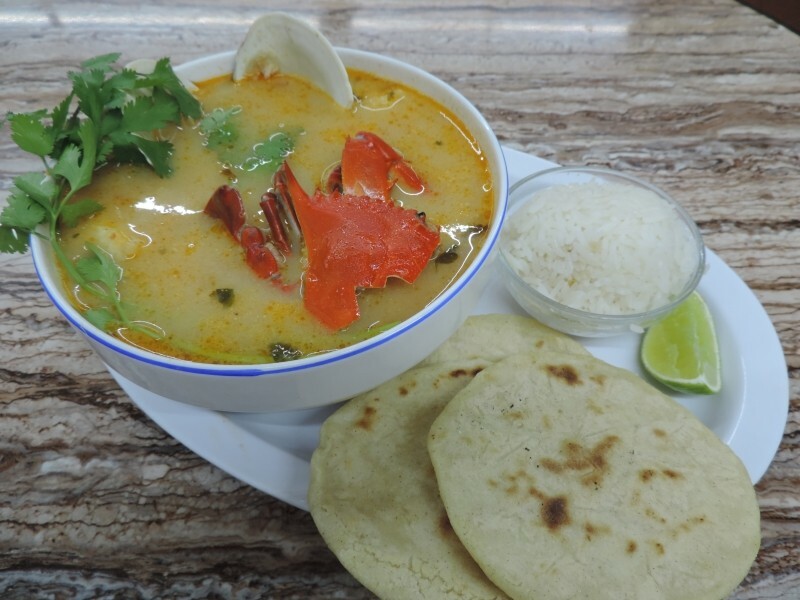 Sopa Marisco made w/ fresh seafood, served with rice, handmade corn tortillas and fresh lime! Las Veronicas have been open barely a month, and yet the business is steady from morning til close, with plenty of folks calling in orders for breakfast—nothing quite like a hot corncake filled with cheese or pork to get you through your morning! Add a cup of horchata—a cold, sweet drink made the Salvadoran way: blended of ground rice & peanuts, flavored with cinnamon—or fresh mango juice and you’ll be planning to get back there for lunch! At only $2 for a large pupusa, and $1.25 for your drink, you’ll come out smiling—three pupusas make a hearty meal, especially when served with crispy ‘curtido’, a Salvadoran slaw of shredded cabbage, carrots, peppers and vinegar: all for well under $10. Lunch brings not only your choice of pupusas, the daily tostada or taco special, but full plates with grilled chicken breast or carne asada (thinly sliced, marinated, grilled beef) accompanied by rice, black beans, pico de gallo (fresh topping of chopped tomatoes, onions and peppers in lime juice) plus three handmade corn tortillas. Cash or card accepted, and if you’re in a hurry, be sure to call ahead. There’s a wait of a few minutes longer than usual, but that’s because everything is made fresh as it’s ordered, from scratch. 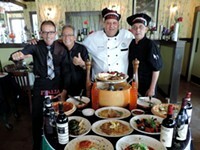 The menu is simple but the food is lovingly well-prepared and the service friendly and informed. Veronica hija’s English is conveniently fluent for answering any questions you may have, and be sure to check out their Facebook page.